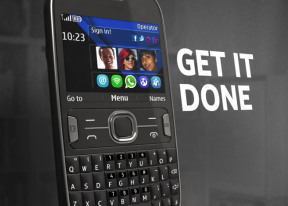 The Nokia Asha 302 is running Series 40 and is going back to basics with keyboard-and-softkey input only. The icons resemble those of Symbian Belle, which is good - we like the unified look. Active standby mode is available as usual, only here Nokia calls it Home screen more. It divides the screen into three sections, each effectively a widget. The top row of the screen (above the widgets) is reserved for status indicators (time, signal, etc.). By default, the Social widget is on top (Facebook, Twitter and Flickr integration), then there's the Favorite contacts widget and the Shortcuts bar. You can easily replace those with others - Radio and Media, WhatsApp, WLAN, Calendar, Chat and a few others are available. There are a number of keys that can be assigned shortcuts. The softkeys default to Go to and Names. The D-pad can also be used - left for a new message and right for the Calendar (if you disable Home screen mode, you can use up and down for shortcuts too). Then there are the two dedicated shortcut keys - the Contacts and Messaging keys. They bring the total of keys available for shortcuts to 6 (or 8, depending on the home screen mode). Each key can be assigned any function from the phone you like - for example, the Messaging key can fire up the Twitter client or the Nokia Chat app, it doesn't have to be an SMS-related function. The main menu has only two views - Grid and List. The grid layout offers numpad shortcuts but they aren't very well implemented - you get four shortcuts per row on the screen but the numpad buttons are three on a row. So, the first numpad on the second row (the number 4), opens up the last (fourth) shortcut on the first row of the menu. It's not very intuitive, but you can get used to it. You can also rearrange the icons in the menu in whichever order you like, in both grid and list view. The familiar Go To shortcut is available and it gives you access to a list of several homescreen shortcuts. You can customize which shortcuts are available here. The lockscreen is standard Nokia - it tells you how to unlock the phone or gives you the date and time if you press the red receiver key. The biggest omission as usual is multitasking - we've given up hope that Nokia will add that a long time ago. You can't leave an app running in the background (other than the music player), but a lot of the built-in services (that cover things like email and chatting) work just fine. Third-party apps are another story, however. The phonebook of the Nokia Asha 302 will store about 2000 contacts depending on the fields you use, which isn't as good as unlimited storage but should do for those of us that aren't that popular. You can set the phonebook to display contacts from the phone memory, SIM memory or both. Adding a contact is simple and straightforward - the phone asks for number, first and last name and that's it. When you need to add other details you can always go back and edit the contact. The phonebook can be set up to automatically store new contacts in a chosen location (phone, SIM) or to always ask. Each contact can be assigned a variety of fields but the phone numbers are limited to 5. First names are separate from last names, eliminating problems which may occur with synchronization. You can assign individual ringtones to each contact. A handy shortcut in the Options menu for each contact brings up the SMS conversations you've had with that contact. The phonebook has search functionality too. Contacts can be copied, moved or deleted either individually or in bulk. We had no issues with signal reception with the Nokia Asha 302 and the in-call sound was loud and clear. Making a call with the Asha 302 brings up memories from the past - you can use the numpad keys to enter a phone number (if you were wondering about smart dialing, don't - there isn't any), or you can pick a contact from the names menu (by using the QWERTY keyboard to search for the one you need). Speed dialing can be enabled if you need to dial some contacts more conveniently or you can use the Favorite contacts widget. The Nokia Asha 302 supports Voice clarity, which enhances the quality of in-call sound. The Nokia Asha 302 comes with the standard (and quite capable) S40 messaging. It can handle all the common message types including SMS, MMS, as well as flash and audio messages and there's easy email setup, too. The physical QWERTY keyboard is an added bonus for the heavy texter - it can run circles around regular 12-button numpads. The standard Inbox view is available but you also get a Conversations view mode (that's the threaded message feature). The editor is well organized and you won't spend too much time finding your way around. Pushing the left soft key reveals options where you'll find insert symbol and object. Symbols is an easy way to insert smileys or the symbols also available through the QWERTY keyboard. When composing a message there's a character counter and message part counter available, and when you're done you can pick the recipient from the contacts list, the recently used numbers, the call log or contact groups. You can have a favorite contact too (just one). Inserting an image automatically transforms the text into a multimedia message. WhatsApp comes preloaded on the Nokia Asha 302. It has a simple tabbed interface and you can chat with all contacts in your phonebook that have the app on their phone. Besides regular text messages, you can also send photos, video and audio files. There's a WhatsApp widget available for the home screen so you can easily start a new chat and check incoming messages. The Mail app lets you create multiple accounts on multiple networks with just your email address and password. It works with POP3, SMTP, and IMAP4 protocols and supports multiple email accounts. The email client supports SSL. Emails are received in the background and you can put a Mail widget on the homescreen to keep track of new emails (the widget offers practically no info on the new emails though). The physical keyboard is a great help when composing messages. Writing even long messages is pretty easy to do.